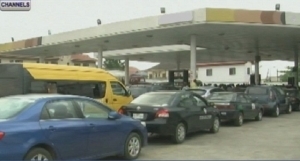 The Pipelines and Products Marketing Company has asked the Nigerian populace to calm down as petroleum products will be available in the fuel stations soon. The MD of PPMC, Esther Nnamdi-Ogbue said that about four vessels containing 30,000 tonnes of PMS arrived in the country on Sunday and the agency is doing all it can to ensure that the product is distributed efficiently. Queues returned to the fuel stations in the last week and many motorists have been complaining about the seeming worsening situation in fuel supply.